When you think about it, all of our days are filled with some time on Boca Raton’s roadways. Driving to events, dinners, theater experiences and even the airport can become a chore though. At M&M Limo & Airport Service Inc, we know that the right transportation service in Boca Raton can offer relaxation and ease to your journeys. If you’re looking for the best and most professional corporate transportation in Boca Raton, you can count on our services at M&M Limo & Airport Service Inc.
Each of these vehicles may be the perfect choice for your corporate transportation in Boca Raton. Your vehicle choice will depend on the size of the party you’re transporting and the formality of your needs. For example, if you’re simply looking to bring employees to and from the airport, our clean and spacious vans can help. We have 15 passenger vans for your corporate transportation in Boca Raton. Of course, we also provide other elegant options for your professional transportation service in Boca Raton, such as limousines. When it comes to corporate transportation, our limousines at M&M Limo & Airport Service Inc are a true treat for your team! Bringing employees to a holiday party, to the airport, to a meeting or anywhere else by limousine brings an instant touch of class and elegance to the entire experience. At M&M Limo & Airport Service Inc, our limousines are the most popular vehicle choice for our transportation service in Boca Raton. What is the M&M Limo & Airport Service Inc difference? When it comes to finding the most professional and elegant transportation service in Boca Raton, we invite you to work with our team at M&M Limo & Airport Service Inc. We provide the most professional, elegant and timely transportation services. Whether our chauffeurs are behind the wheel of one of our elegant limousines or we’re providing transportation in one of our classic SUVs, you can enjoy truly professional and luxurious services. 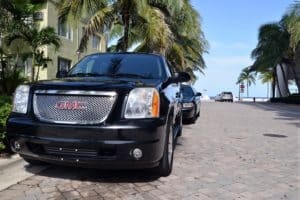 It’s always a great time to enjoy our top quality corporate transportation services in Boca Raton. When you’re looking for the most professional and timely transportation, we invite you to call on our team at M&M Limo & Airport Service Inc. To book your reservation, please call (561) 488-6014. Looking for Hourly Car Services in Boca Raton? At M&M Limo & Airport Service Inc, we believe that transportation service in Boca Raton should be a customizable experience. After all, not everyone needs a limousine, and not everyone needs SUV transportation. Whether you’re looking for limousine transportation or hourly car services in Boca Raton, we’re here to help. At M&M Limo & Airport Service Inc, we offer many different vehicles for our hourly car services in Boca Raton. Our limousines are our most popular vehicle when it comes to transportation service in Boca Raton. That’s because when it comes to transportation, nothing brings luxury quite like a limousine. We have limousines in all vehicle types, such as town car style limousines and even limos molded after popular SUVs. In addition to limousines, clients can enjoy many other types of vehicles with our hourly car services in Boca Raton. We have SUVs, vans and luxurious cars as well. We can fit anywhere from 2 to 15 people in our vehicles. Getting from Point A to Point B is easy with our hourly car services in Boca Raton! Airports are a necessity when it comes to travel, but very few aspects of air flight are truly enjoyable. At M&M Limo & Airport Service Inc, we know that when it comes to airports, parking is often one of the biggest issues. Rather than paying up the nose for airport parking, walking what feels like miles to the terminal and worrying about your car’s safety as you’re on your trip, try out our hourly car services in Boca Raton instead! At M&M Limo & Airport Service Inc, our airport transportation car services make things much easier. We can help you get to the airport right on time and in style. Instead of fighting traffic and searching endlessly for overpriced airport parking, you can enjoy a relaxing and luxurious ride to start your trip. When you return, we’ll pick you up right on time! When you’re looking for the very best hourly car services in Boca Raton, we hope you’ll call on our chauffeurs at M&M Limo & Airport Service Inc. We’re committed to bringing ease to all of your transportation needs. Whether you’re heading to the airport or you’re heading to a wedding, you can count on our team at M&M Limo & Airport Service Inc. Call (561) 488-6014 for your free quote. Posted in Airport Transportation, Boca Raton, Corporate Transportation, Driver, Limo, Limo Service, Limousine, News, Palm Beach County, Palm Beach International Airport, Party, Party Limo | Comments Off on Looking for Hourly Car Services in Boca Raton?